Tonight jetty is a bit quiet on a saturday night. Not very crowded as compare to other saterday night. Only about a dozen of long rods at the end part targeting big game fish. Many are concentrating catching squid. Tide was down going but was about coming to the end. Suddenly, Ah B Daiwa surf rod reel alarm sounded. Simon was the first to reach. He pickup and strike but missed the fish. Everyone was laughing at this false alarm. Five minute later, Simon rod alarm sounded. This time it was louder and longer. Leng Kia was the first to pickup and strike. Wow !….U can see the rod bend and the line strip. Haha…big one coming. Everyone started to wind back their line to make space for the big fight. I prepare my gaff so did Simon who is the rod owner. Our common mind we thought it was a stingray about 10 over kg. The fish after striping some line it stop running and Lend Kia manage to wind back some line. He then pass the rod to Tee Kia who continue to gain line back. After awhile he pass the rod to me. When I took over, the fish is about 50 meter away from the jetty. I gave a few pump and it was closer now. But the fish started to turn to the right side and speed up. It seem it was spook by the squid lamp just right below. 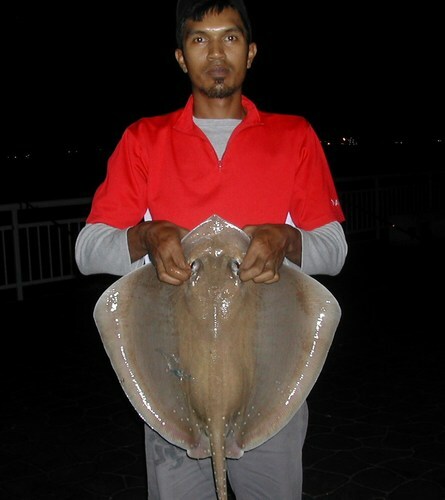 Wow !….I know by now it is not a stingray. The way the fish dash with that type of speed, it definitely not. The fish dash all the way from the left end of the jetty to the right end. Along the way there was three squid lamps hanging below. I was force to run along with it and I take the opportunity to gain back what ever line available. 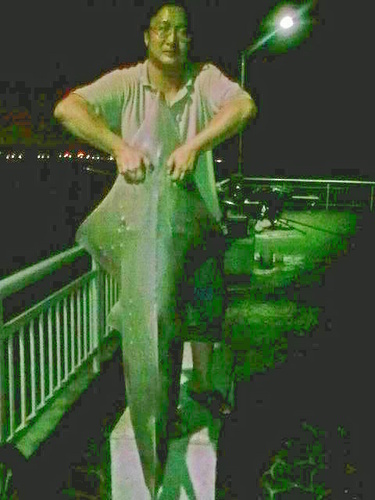 When it reach the right end of the jetty, the fish surface up and those who was present there can see it was a big shovel nose shark. At this time as the fish is near the water surface and firmly secured, I decided to pass the rod to it owner Simon who by now still no chance to touch his own rod. Haha…The fish then make a turn and heading back to the left. Simon fought hard with it. I ask all the squid lamp to be pull up in order to calm down this monster. Its work and now the rod is back in Tee Kia hand. He manage to surface it again near the centre part of the jetty. THe fish also look wear out and was bring nearer to the jetty. I grab hold of Simon rope gaff and sink it in on the right side body near the fin. The fish make a last dash trying to break free but my gaff was fully secure. I lifted it head up the surface and Ah An sink in his gaff on the belly part. It was totally secure now but to pull and lift this monster up the jetty U need more than two man power. I ask for a third one and Commando come along. But his gaff was a bit too short as the water was low. After several trying and still can’t sink in, I ask Simon who’s hand is free to come and take over the rope gaff I was holding. I rush to get my gaff and sink it in on the back of the fish. With three gaff in, we together pull it up the jetty. Yeah !….fish landed and mission completed. Everyone was smiling and happy. It has been a long time that we manage to land a monster with many people involved. Another memory catches from this famous bedok jetty. Many photo was taken and the fish was cut up by Lor Kor who was inform of the catch by Ah Lai and went down to look and do the cut up. Nafi caught this ray when the tide is on the way up. The fish took the bait and cause the reel alarm to have a short screech. Nafi strike it and play slowly to bring it close to the jetty. White with a gaff has already on standby. It was easily gaff up. Went to catch squid so cast a rod out. Bait was not lasting so have to often change it. Tide has already full and started to turn down. The current is picking up fast as it will down to 0.2m in the early morning. Squid was quite rare tonite so has decided to cast out the last bait and will be packing up soon. I was talking to my friend Samad who is about to go home. Suddenly my reel alarm sounded. Went to pick up the rod and strike. Yes….something is at the end of my line and it was moving toward the left has the current has push it. I also heard water splashing. It seem the fish is jumping up. My mind thinking it could be a barracuda or a threadfin. It struggle awhile before i could bring it closer. It turn out to be a big barracuda. The hook was hook only on the side of the mouth as we can see it from the light of my squid lamp. My friend Da-Ling offer to gaff it for me. When landed, it size look huge and fat. I was thinking maybe I broke my own barracuda record of 4kg. But it turn out to be the same weight of 4kg. Look like I have to wait for another chance to break it.